This is essentially a group action method. This could be used in clinical setting(hospitals, therapy centers), non clinical setting like a business establishment in team building, conflict management, stress management, identifying and working with stress, improving communication, building trust, identifying issues etc. This method is a spontaneous and creative method which is used by well trained and certified psychodramtists who are usually called the Psychodrama director. A director enables or facilitates a re enactment of real life situations, past incidents or situations or an inner mental process but acting them out in the present time. Dates and details : Keep in touch with us. Rs 45,000/ – for 12 days of training. 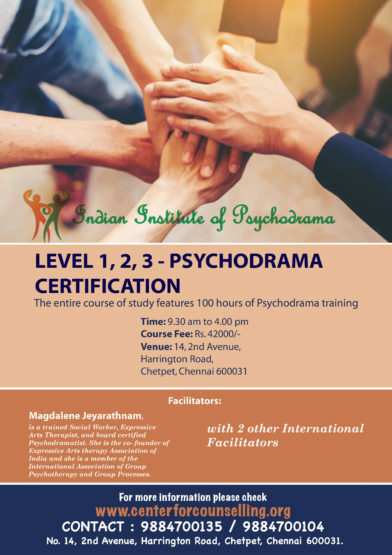 You will receive a certificate from Indian Institute of Psychodrama, this will cover 100 hours of training.